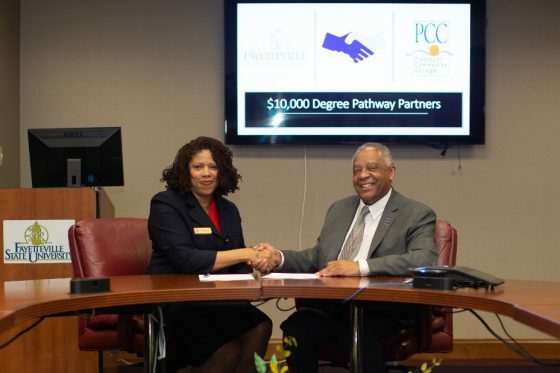 At a meeting of representatives from ten North Carolina Community Colleges hosted by Fayetteville State University (FSU) on Monday, April 1, Piedmont Community College became sixth partner in FSU’s $10,000 ($10 K) Degree Pathway. Launched by FSU Chancellor James Anderson last August as an alternative to the high-cost programs offered by for-profit institutions, the $10 K Degree Pathway permits associate degree graduates of NC Community Colleges to earn a bachelor's degree in one of FSU's ten online degree programs for maximum out-of-pocket costs of $10,000, that's approximately $5,000 at the community college and $5,000 at FSU. Students eligible for federal or state need-based grants will likely pay out-of-pocket costs much less than $10,000. By targeting low-income students who reside in rural counties, individuals frequently shut out of college because of cost, the $10 K Pathway will help achieve the ambitious goal of myFUTURENC of 2 million more 25 - 24 year-old North Carolinians with a postsecondary credential by 2030. Chancellor James A. Anderson noted that the $10 K Pathway provides one of the most affordable pathways to a bachelor's degree in the nation. And as Provost Pamela Jackson noted, all ten online degree completion program bear professional accreditation and/or have received national recognitions for affordability and quality. 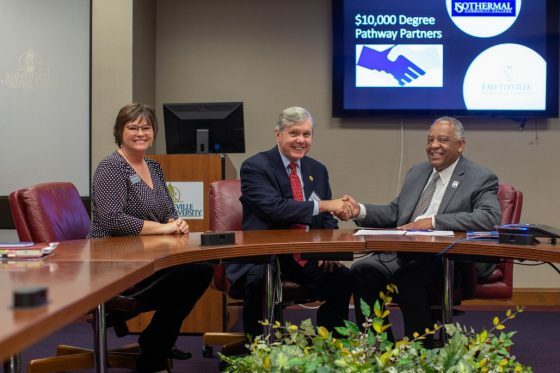 Piedmont Community College is joined by the following other NC Community Colleges in the partnership: Davidson County, Fayetteville Technical, Guilford Technical, Richmond County, along with Blue Ridge and Isothermal who formalized their respective partnerships that were approved last fall. 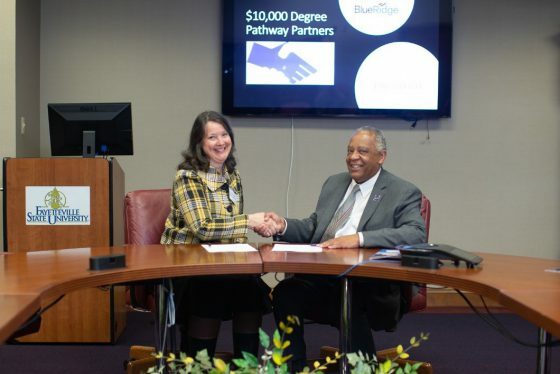 Four other community colleges have indicated an intent to join the partnership in the coming weeks. In her keynote address to the approximately 150 attendees at the meeting, Suzanne Walsh, former Deputy Director of Postsecondary Success at the Bill & Melinda Gates Foundation, noted that with its focus on low-income and rural students, the $10 K Pathway Partnership is unique within U.S. higher education. Dr. Walsh played a pivotal role in establishing the Frontier Set, a group of 31 universities and system offices committed to increasing degree attainment among populations previously underserved by higher education. Funding FSU has received as a Frontier Set member is helping to support the Convening.